Unlike the city in Italy, Venice in Florida is a small town on the Gulf coast of Florida. While it is a relatively small city with a population of around 20,000 people, it is considered to be one of the Happiest Seaside Towns by Coastal Living. Also known as “Venice Island”, Venice is a city which was initially built on water on May 9, 1927, and has a number of renowned bridges. History tells us that Calusa Indians were the first inhabitants of Venice city. Archeologists further reveal that in the 16th century, Florida was pre-occupied by Spanish despite the fact that the southwest coast was abandoned and infested with pesky pests like mosquitoes. While originally Venice, Florida was called “Horse and Chaise” due to an unusual tree that bore resemblance to a horse-drawn carriage. Soon, it was replaced with the name “Venice” coined by Frank Hegel – the father of Venice. He recommended this name because the area looked a lot similar to the famous floating city of Italy – Venice. While the city is relatively newer compared to other cities in the world, it is known for its amazing tourist attractions; one of them being the incredible beaches that are widely known for shark tooth! So if you are planning to visit Venice, Florida anytime soon, then don’t forget to head over to its beaches, especially Venice Beach, where you can collect as many as a hundred shark teeth! Before we guide you on how you can catch shark tooth for yourself at Venice beach, it is important to understand its history first. You may have wondered why Venice, Florida is called the Shark Tooth Capital of the World, well, so did we. A little bit of digging on the Internet revealed that there was a time when Florida was submerged underwater, a place where sharks used to float around and most of them, eventually, died there. The sand of the Gulf of Mexico buried the shark’s dead carcasses. Over time, the sand began washing over the shark remains and exposed their teeth. Scientists believe that when Florida was submerged under water, the waters were quite calm and hence kept the shark teeth in place. But since the seas of Venice have drastically changed over time, they have started exposing shark teeth. Are you curious to see for yourself what these shark teeth look like? Well, then pack your backpack and make a trip to Venice, Florida – the Shark Tooth Capital of the World. In this article, we talk about some of the best tips on how you can find a shark tooth for your collectibles from this memorable trip. 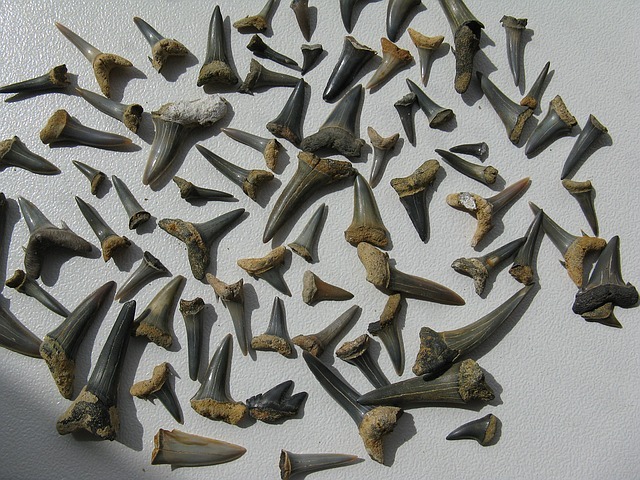 How to Find Fossilized Shark Teeth in Venice Beach? You can’t just walk on over during any time of the day and hope to find shark teeth in Venice beach. The most appropriate time to find shark teeth is in mornings when it is less crowded, and the tides are low. With fewer people around, you can easily look from one point of the beach to the other for shark teeth without getting disturbed. Go as early as 7 or 8 A.M in the morning when you can find as many as hundreds of shark teeth. Don’t lose hope if you can’t go to the beach in the morning. You can still find shark teeth, you will just have to look for them harder. To achieve your purpose, you will be required to step into the water as far as it touches your waist, then try touching the sand and getting a scoop whether you have found a shark tooth or not. Mind you; this is quite a risky way to search for a shark tooth, so we suggest you use a flea-rake to help make the search easier. If the flea-rake is unavailable, then you can try using a mesh float. With this equipment, the sand and water should pass through the hole, but bigger things like a shark tooth should stay back. While these two pointers are necessary to make your search for shark teeth a successful one, you will need to keep a couple of more things in mind so that you stay safe and protected throughout. You may not know it, but UV rays can damage your skin, resulting in skin cancer and other skin diseases. People, mostly, go to Venice beach during the summer months, when the heat level is extremely high. Since the search for shark teeth can last for hours, it is necessary that you put on 15+ SPF sunscreen all over your body and face. This will also protect your skin from getting sunburn. Another essential element that you must be equipped with when you visit Venice, Florida is a hat. Since it can be super hot at the beach with direct sunrays getting into your eyes, finding shark teeth can end up being exhausting and troublesome. Which is why having a big, round hat that can protect your face from the sun is extremely important. Patience is a virtue that you can’t buy from any shop but will have to develop when looking for shark teeth in Venice beach. If you are unable to find shark teeth immediately don’t start panicking. Keep your cool and continue looking for them until you find one. Venice makes for a wonderful vacation spot as it offers a number of tourist attractions; out of which the most visited one is Venice beach. If you want to book a vacation rental for Venice, Florida – the Shark Tooth Capital of the World, contact us today!